No matter which area of New England you’re intent on exploring, there always seems to be a place where both the locals and visitors gather to enjoy good food, great company and an unforgettable ambiance. 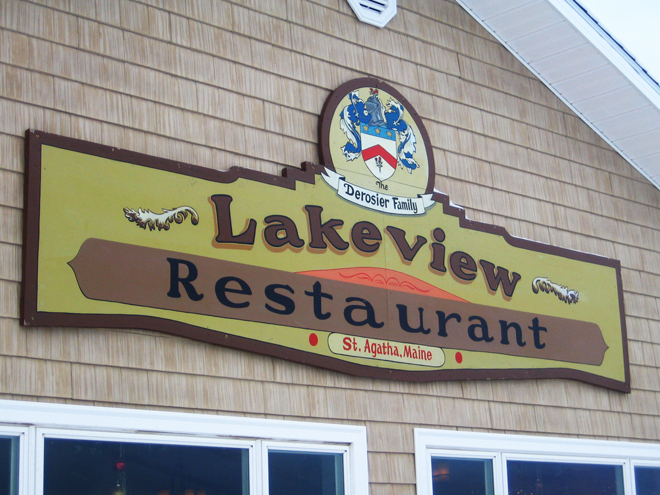 In northern Aroostook County, this central meeting place is the Lakeview Restaurant in Saint Agatha. 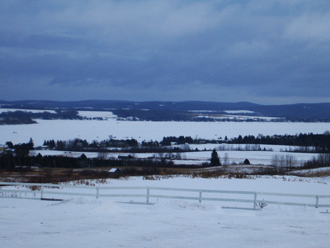 The Lakeview is, as you might have guessed, perched on a small hill overlooking Long Lake. The 6000-acre lake, which is a regional hub for fishing and recreation, is a tranquil spot savored by tourists and locals alike. It provides a beautiful backdrop to the restaurant and is visible from nearly all of the venue’s oversized windows. The restaurant’s parking lot is also the convergence point for a dozen or so snowmobile trails, bringing in chilled diners during even the snowiest months. 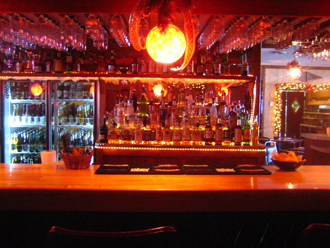 The Lakeview’s interior is cozy and welcoming. The foundation of the décor is a tartan and wood-heavy country style accented with retro pieces and spots of undeniable European flair (such as the dramatic iron-wrought chandeliers in the vaulted main dining room). The seating - clearly adopted for its functionality over its aesthetic values - is comfortably worn without appearing dingy, and by candlelight, the setting takes on an almost romantic ambience. The wait staff, fluent in both English and French, cater to each guest’s whims and linguistic preferences. As the majority of off-season clientele are locals, the friendly rapports between customers and staff is charming to see. Waitresses frequently stoop on bent knees to talk with children, and the waiters give their friends hearty handshakes and welcome them back for another fine meal. Even outsiders are treated with remarkable gusto; it’s not uncommon for a waitress to slyly try to guess your hometown based on your accent, and it adds a fun twist to the dining experience (though our waitress eventually pinned us as New Yorkers instead of New Jerseyans by the end of the meal). Fortunately for the Lakeview, the large menu is backed by a well-trained kitchen staff. Though we frequented the restaurant on a Friday evening (undeniably its busiest night) our orders were delivered promptly and expertly. My lobster, removed from the shell and sautéed in a butter and herb sauce, was served piping hot atop the restaurant’s own seafood stuffing. (The Lazy Man's Lobster - $19.99). Despite being nearly 150 miles from the nearest stretch of coastline, the seafood was fresh and the taste was not masked by overzealous seasoning. My dining partner opted for one of the nightly specials, a seafood fettuccine ($14.99) that boasted a rich cream sauce and several types of ocean delights. 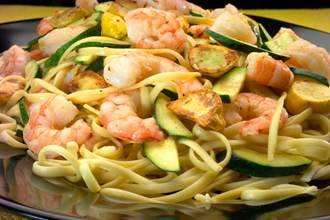 The cream sauce was light with a fair amount of melted cheese, and the fettuccine noodles were nicely peppered with just the right amount of seafood. Our salads were crisp and flavorful, and they lacked the sodden, limp lettuce leaves that occasionally haunt small-town eateries. Though the dressings were regrettably common, the vegetables were refreshing and reflected nicely on the chef’s insistence on high quality produce. Feeling adventurous, we also sampled a blooming onion ($6.99). It arrived at the table steaming from the fryer. Fortunately, there was minimal oil present and the serving sauce, a creamy horseradish dressing with a significant amount of spice that traveled directly up the nostrils, paired quite nicely with the lightly fried onion slices. Though perhaps a bit plain for those seeking haute cuisine, we agreed that it was a worthy side. Like the onion, dessert was good if not a bit ordinary. My bread pudding ($3.99) arrived at the table at a comfortable temperature. The pudding while a bit drier than the artisan varieties I’ve sampled in New Jersey, did manage to capture a wonderful fragrance of warm cinnamon and pumpkin pie spice. A small dollop of vanilla ice cream paired nicely with the spices, though a more exotic gelato (perhaps one with a hint of maple) would have taken the dessert to the next level. As we dined next to the largest window in the restaurant, we watched as a thick mist encroached upon the restaurant. Five feet beyond the patio was shrouded in thick vapor which shifted visibly during the meal. As we finished dessert, a small break in the weather revealed a breathtaking view of the lake in the distance; but just as soon as the mist disappeared, it quickly rolled back in. Though our water view was mostly obscured, the Lakeview itself did not disappoint.